Do's and Don'ts: Can you put a trampoline on grass? » Do’s and Don’ts: Can you put a trampoline on grass? Do’s and Don’ts: Can you put a trampoline on grass? Setting up a trampoline has become an incredibly popular and effective way of making your garden more child-friendly and fun. 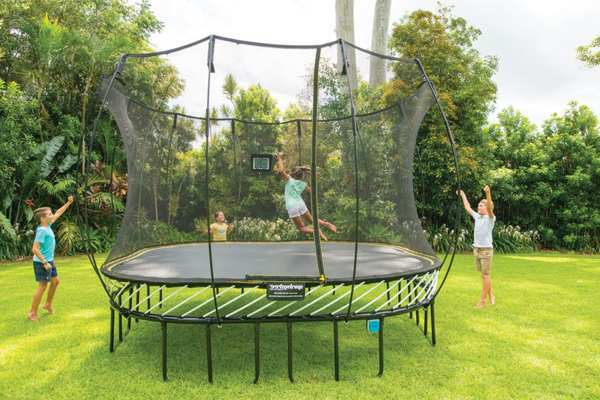 However, a question every trampoline owner asks themselves sooner or later is whether it’s advisable to put a trampoline on grass and if they should be using a trampoline grass mat. This question is important since a trampoline is no subtle detail. Such a physically large object will take up a great part of your garden. Naturally, it will have a noticeable impact on the upkeep of the area it occupies. So, how exactly does a trampoline affect the state of the grass in your garden? The answer to this question may be more complex than expected at first. Namely, some trampoline owners report negative experiences, claiming that the trampoline destroyed the grass in their garden. Others, however, declare the opposite case. Clearly, the way a trampoline alters the growth of grass depends on the specific spatial features of the exact spot in your garden where it is set up. With that in mind, here are some detailed insights into the consequences of setting up a trampoline on grass. As mentioned, some trampoline owners report a positive impact of a trampoline on the grass in the vicinity, while others experience the opposite. Their results differ because the climate conditions created underneath their trampolines are not the same. For instance, if someone places a trampoline in a directly sunlit area in a very warm climate, the area underneath the trampoline will transform into a miniature greenhouse. However, in the majority of cases, setting up a trampoline on the lawn is going to harm the grass underneath by restricting sunlight to a lesser or greater degree. 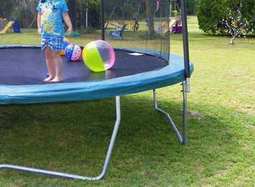 Since most trampolines are large and heavy, they are not easy to move around. 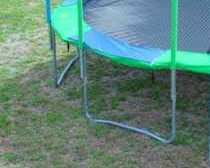 When you place a trampoline over grass for an extended period, the grass is likely to wither and leave an empty spot on the lawn. If you plan to set up a trampoline over grass in a fixed spot, you need to prepare the grass in order to keep it alive. If you live in a very warm region, it is possible that no additional preparation will be necessary. In all other cases, however, a great way to keep the grass alive is to prepare some lawn seeds and grass feed. By planting new seeds regularly, you can make sure the grass patch remains healthy and verdant. On top of that, if you don’t want your trampoline ruining grass, you should set up a functional drainage system in the area below it. The easiest way to mow the grass under your trampoline is to move the trampoline once a week. That should also help provide more sunlight to the grass. 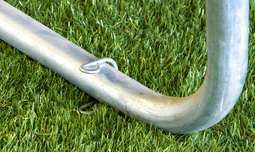 Besides, keeping that patch of grass trimmed along with the rest of your lawn can help keep the grass healthy. However, you should keep an eye out for the color of the grass to know whether the trampoline should be moved more often than your mowing routine demands. Fortunately, even if the garden has experienced some negative consequences from a trampoline, it can be easily fixed and maintained. The options at your disposal here are all the standard techniques of garden maintenance. You can plant lawn seeds to rejuvenate the patches of grass, and add some fresh dirt to revitalize the soil. If the legs of the trampoline left some gaps, fill those up with fresh dirt. With a larger budget, you can consider adding turf to speed up the recovery process. Many trampoline owners move their t﻿﻿rampolin﻿﻿e around the garden to give the grass an opportunity to rejuvenate. If you want to keep your trampoline stationary and don’t want to put too much effort into grass maintenance, you can replace the grass beneath it with mulch. The only important thing is to make sure the trampoline is stable and that the drainage system is in place. A more expensive alternative to putting trampoline on artificial grass is building a sunken trampoline. Such a trampoline is partly underground, with the rubber mat located on ground level. What makes this method appealing is the fact that it makes the trampoline more stable. Namely, if the trampoline is too heavy, the legs will put enough pressure on the grass to completely kill it in these spots. Moreover, if the soil in that area is too soft for the trampoline, the legs will end up sinking. More often than not, that will result in a lopsided trampoline, which can become a true safety hazard. With a sunken trampoline, you avoid these dangers. What’s more, those are covered by grass covers or lids, which can completely hide the trampoline from sight. Once you’re done with the trampoline, simply put the cover down, and no one will notice any difference. With this solution, you won’t have to worry about grass maintenance anymore. To answer the initial question - yes, there is nothing wrong with putting a trampoline on grass. What matters is to keep in mind the ways the trampoline can affect the grass and your entire garden. Those who care about the appearance of their garden have a number of maintenance techniques at their disposal. 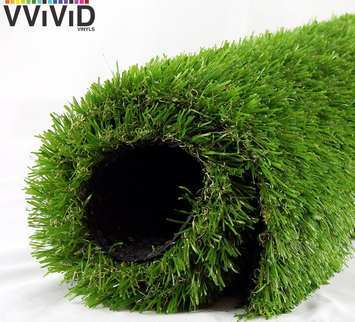 However, the most practical way to keep your lawn looking good is to install a trampoline grass mat. In the end, it is all a matter of personal preference. The only crucial thing is to keep the trampoline secure and to place it on the stable and adequately soft ground.